Powers: After exposure to experimental nano-technology he was granted superhuman strength, durability and endurance far beyond a normal man. His strength is comparable to Juggernaut making him able to lift about 100 tons. His body can also generate devastating concussive force blasts from his hands and eyes. These blasts are as powerful as the very highest form that Iron Man can generate. 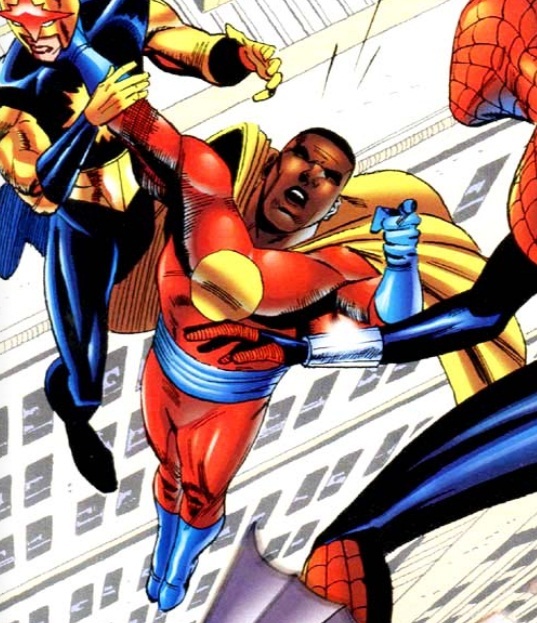 He is essentially a Black superman easily able to take on and defeat Iron Man, Juggernaut and the Avengers all at once and defeat them. After years as the friend of Tony Stark and after operating as both Iron Man and War Machine he returned to work with Tony Stark on a new experiment to better mankind. This experiment involved highly sophisticated and evolved nanotechnology pioneered by Tony Stark. Knowing the risk Tony decided to test it on himself first to determine if it was safe. James took it upon himself to protect his friend from the test and so subjected himself to it. At first it seemed safe as the nanotechnology endowed him with superhuman powers to rival Thor. As time went on however his personality was completes consumed by the nanites. Now little more than a semi sentient cyborg with incredible powers Tony took him as a personal bodyguard. Recently he came to meet Spider-Girl daughter of Peter Parker and Mary Jane and the new Avengers, with no name and not wanting to be referred to as James she called him “Fred”; he would be called this in most of his appearances. He aided them in a few battles while controlled by Tony. An encounter with Venom however corrupted his cybernetics and brought a limited form of his personality into play. He went on a rampage which found him defeating Juggernaut, Spider-Girl and the entire Avengers team. Even when Tony as Iron Man tried to stop him he found himself outmatched by the sheer power of him. He was eventually overloaded with a massive amount of electricity thanks to Venom. Tony has since returned him to Stark Labs, he has not been seen since.